Your pupil changes size to control how much light enters your eye. You can watch the pupil of your eye change size in response to changes in lighting. You can also experiment to determine how light shining in one eye affects the size of the pupil in your other eye. Place the magnifying glass on the surface of the mirror. Look into the center of the magnifying glass with one eye. If you wear contact lenses or glasses, you may either leave them on or remove them. Adjust your distance from the mirror until you see a sharply focused and enlarged image of your eye. You may need to adjust the position of the magnifier to get the clearest image of your eye. Notice the white of your eye, the colored disk of your iris, and your pupil, the black hole in the center of your iris. Shine a light into the pupil of one eye. If you are using a small mirror, hold the flashlight behind the mirror and shine the light around the edge of the mirror into your eye. 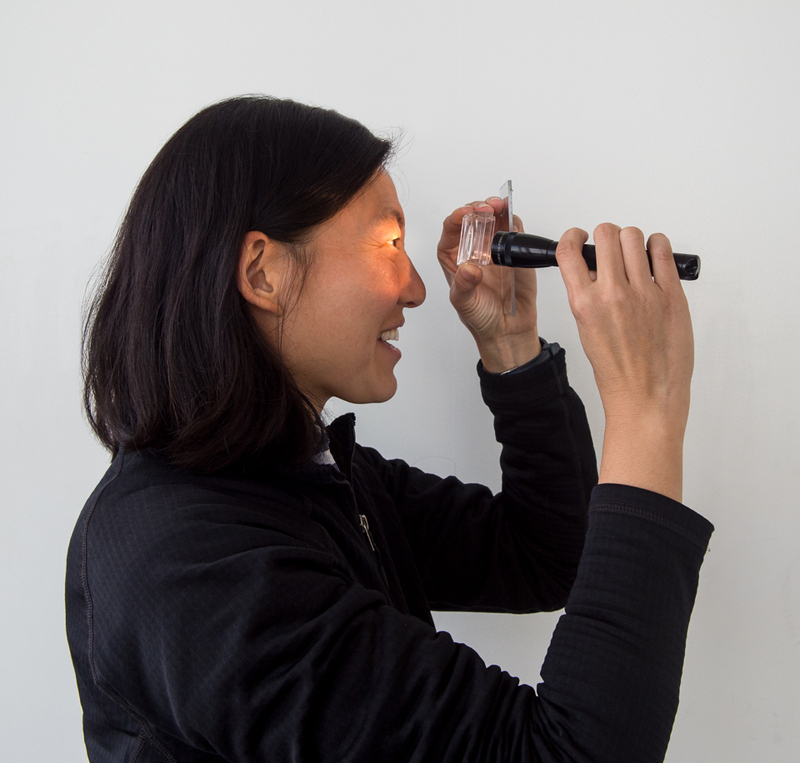 If you are using a large mirror, bounce the flashlight beam off the mirror into your eye. Observe how your pupil changes size. Notice that it takes longer for your pupil to dilate than it does to contract. Notice also that the pupil sometimes overshoots its mark. You can see it shrink down too far, and then reopen slightly. Observe changes in the size of one pupil while you, or a partner, shine a light into and away from the other eye. In a dimly lit room, open and close one eye while observing the pupil of the other eye in the mirror. The pupil is an opening that lets light into your eye. Since most of the light entering your eye does not escape, your pupil appears black. In dim light, your pupil expands to allow more light to enter your eye. In bright light, it contracts. Your pupil can range in diameter from 1/16 inch (1.5 mm) to more than 1/3 inch (8 mm). Light detected by the retina of your eye is converted to nerve impulses that travel down the optic nerve. Some of these nerve impulses go from the optic nerve to the muscles that control the size of the pupil. More light creates more impulses, causing the muscles to close the pupil. Part of the optic nerve from one eye crosses over and couples to the muscles that control the pupil size of the other eye. That’s why the pupil of one eye can change when you shine the light into your other eye. In this experiment, the light reflecting from your eye passes through the magnifying lens twice—once on its way to the mirror and once on its way back. Therefore, the image of your eye is magnified twice by the magnifying glass. The size of your pupils actually reflects the state of your body and mind. Pupil size can change because you are fearful, angry, in pain, in love, or under the influence of drugs. Not only does the pupil react to emotional stimuli, it is itself an emotional stimulus. The size of a person’s pupils can give another person a strong impression of sympathy or hostility. The response of the pupil is an involuntary reflex. Like the knee-jerk reflex, the pupillary response is used to test the functions of people who might be ill or injured. You may have seen a doctor shine light into the eyes of a person with a suspected head injury—they are looking at the pupillary response. The pupil of your eye is also the source of the red eyes you sometimes see in flash photographs. When the bright light of a camera flash shines directly through the pupil, it can reflect off the choroid, which supplies red blood to the retina (the light-sensitive lining at the back of your eye), and bounce right back out through the pupil. If this happens, the person in the photograph will appear to have glowing red eyes. To avoid this, photographers move the flash away from the camera lens. With this arrangement, the light from the flash goes through the pupil at an angle, illuminating a part of the retina not captured by the camera lens. Many cameras are equipped with red-eye reduction features, such as a pre-flash that causes pupil constriction before the actual flash that illuminates the photo. Keep an eye on your retinal blood supply network. Discover the outer limits of your eyes.